CooksRecipes has quality, kitchen-tested recipes for diabetic-friendly main dish salads that you can count on for accuracy and deliciousness. 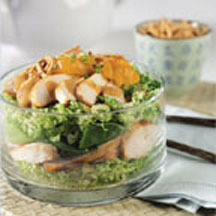 Marinated and grilled chicken is layered with an Asian slaw mix, snow peas, mandarin oranges with a tangy ginger-chile-garlic dressing. 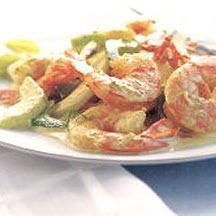 Fresh lime, curry powder, and creamy sour cream make a zesty dressing for this refreshing summer salad. 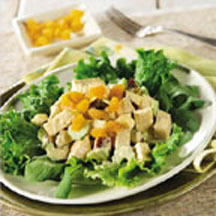 Chunks of apple, celery and turkey are tossed with a creamy curry sauce and served on a bed of salad greens.